I picked up this breezy prairie tunic during Calypso’s sale last week and know it’s going to be a repeat offender all summer. 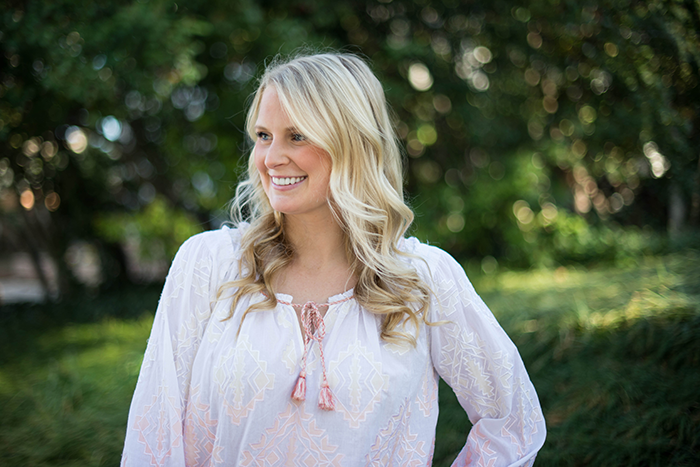 It’s such a comfortable and classic fit that looks fabulous with my favorite pair of white jeans (now on sale!) or with a good pair of denim cutoffs. This style by J BRAND really is my favorite – I have them in black with leather panels too (on sale now! ), and am also considering picking them up in their newest shade (gray). 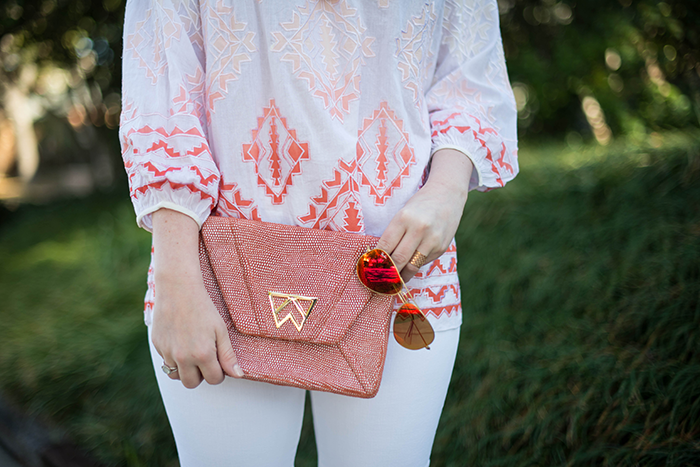 It matches my favorite Kelly Wynne clutch (other colors available here) perfectly, don’t you think? Speaking of Kelly Wynne, the designer is hosting a trunk show today at French Cuff Boutique in Houston from 10am-6pm! Hope all my H-town readers can stop by and see the latest pieces and meet Kelly! Click here for details on the trunk show. 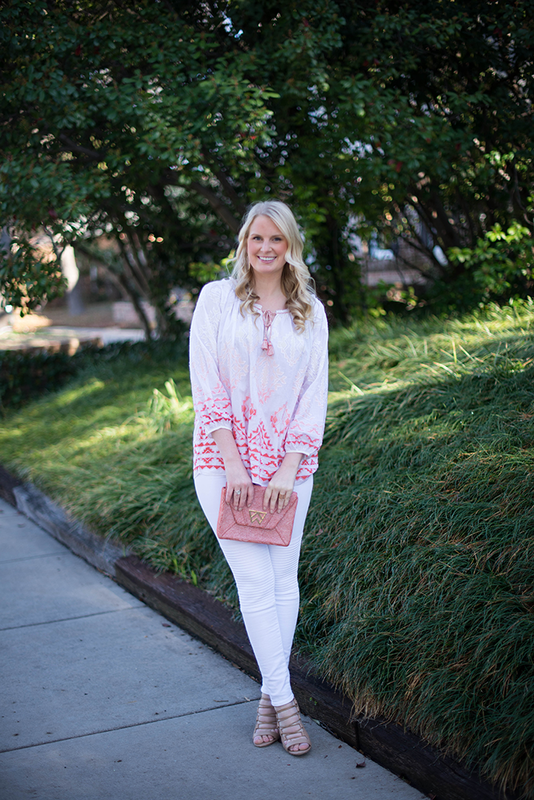 PS – don’t forget to enter my Kendra Scott LUXE Giveaway! Those jeans! I’ve been looking for a new pair of white denim and these look fab! This is look is very resort chic. Love the print of that top! I’ve always love these jeans, do you know if they run true to size? Gorgeous peasant top as well. Those jeans are insane, I’ve been waiting for the black pair to go on sale – thanks for the heads up! Oh, and I just love the ombre coloring in the tunic, so chic! I love that tunic and those jeans in white are amazing! Such a great spring look! Love that clutch too. Great look! That clutch is beautiful and I love those shoes!! So chic! I love the detailing on the pants! Love the beautiful color theme in this outfit! 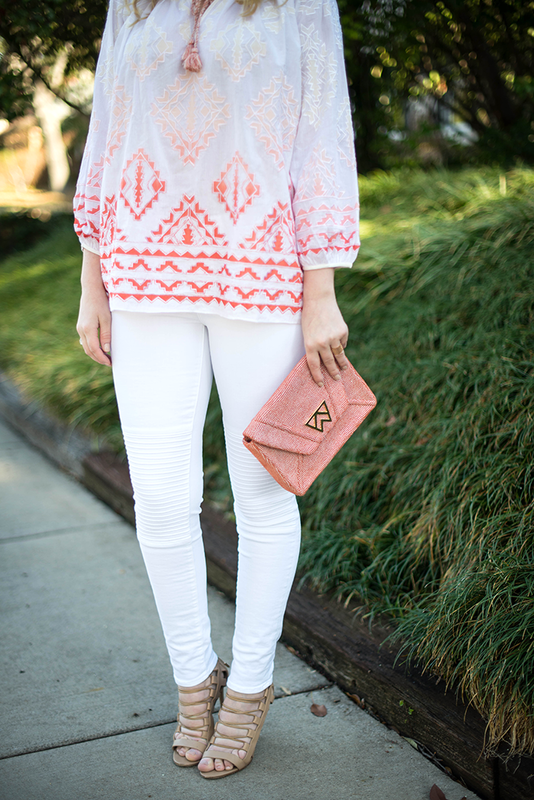 Such pretty shades of peaches and corals, right down to the sunnies! LOVE that tunic! Calypso is one of my favorite go-tos all year around. I love that the embroidery is ombre, it’s such a cool touch! I’ll take the shoes and the top please! Great springy combination. so pretty! I love this whole look! Pink and white always look so fresh together! and those shoes are amazing – I must have them! You are always so perfectly polished! You are the cutest! Also I am in love with those heels. How cool are those J Brand jeans – I love the details! That is a great outfit and super practical too! Love it! Merritt, I love this outfit. Those jeans are the b-o-m-b! I love the whole look but especially that great calypso top! I am also eyeing your Kelly Wynne clutch — I have seen her bags around a lot lately and I’m thinking I might need to add them to my wish list..have you been happy with the clutch? White on white..so perfect for spring :) And your hair looks beautiful!! Lovely tunic! It’s so breezy and fluid. Perfect for summer. You can dress it up like you did with jeans and heels or pair it down with denim cut offs and sandals. Those glasses look great with that top! So pretty on you! love the texture on those jeans! Love that clutch! I have a Kelly Wynne shoulder bag that I absolutely adore!